Having always been involved in some sort of sport Aniko was inspired to study sports massage to enable people to do more of what they love. Aniko qualified as a Sports and Remedial Massage Therapist after studying at the London School of Sports Massage. She is a member of the Institute of Sports and Remedial Massage. Her treatments include various soft tissue techniques such as: soft tissue release; trigger point therapy; muscle energy technique; deep tissue work; and rigid- & kinesio-taping. Working together with her patients Aniko tailors her skills to the individual’s need for the best results. 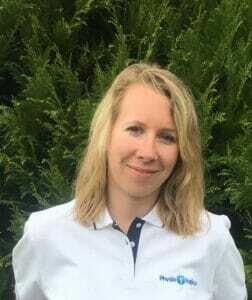 She is passionate about her job and has achieved good results in alleviating aches & pains, restoring mobility, keeping people injury free and providing massage at sailing events. In her spare time Aniko enjoys mountain biking, stand up paddle boarding, windsurfing and hoping to learn to kitesurf in the near future.